Being a mom of Irish dancers, I have to say that the busiest time of year for us is St. Patrick's Day and the week leading up to it. Besides performances at nursing homes, schools, churches, and anywhere else one can think of, there is also at least one St. Patrick's Day parade. Trying to fit our family traditions in and amongst our Irish dance schedule is difficult, but something that we always find a way to accomplish. I LOVE a parade! Don't you? 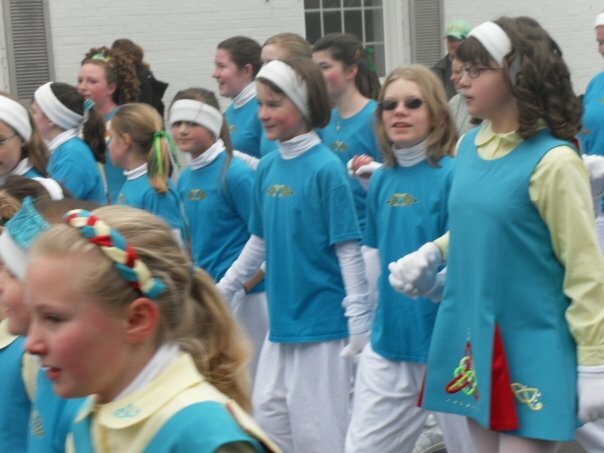 With Irish dancers, the best parades, for me, are the St. Patrick's Day parades. Music, candy, horses, bands, motorcycles, pretty pageant girls waving, dancers, more horses, more candy, some parade floats, more bands, and loads of leprechaun-dressed people, dogs, and politicians. Of course, one can not forget the Irish dancers. 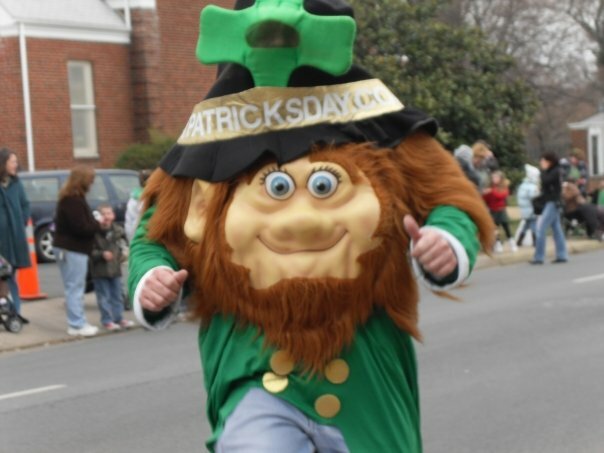 One of many leprechauns we've spotted at past parades. Hubby actually made this his Facebook profile photo. Come drizzly weather, blustery winds, and bitter cold, the month of March always provides some adventure as far as timing for a parade. This year, in our area, it looks like the weather is going to be fabulous. Yay! But even if it wasn't going to be gorgeous weather, the kids would get in their Irish dance school's parade attire and wave, walk, and dance their steps to the Irish music. My kids look forward to the parade every year. Aside from parades and performances, our family has some traditions that started when the oldest of my six kiddos was still small. Those traditions have evolved over the years to what they are now. Our biggest tradition is that we have a leprechaun who visits our family. Don't believe me? Well, my littlest ones will tell you, it's true! They've seen evidence every year on St. Patrick's Day. I have friends who dye their toilet water green, leave tiny footprints through their house, put green dye in the milk or food for the day, and even leave little notes from the wee folk for their wee children to find. My children wake up to a note on the kitchen table from our visiting leprechaun. It is always in a curly-cue font, and green ink. I'm going to share this tradition with you, but please forgive my poetry or lack of poetic ability. "Good morning all you fine boys and girls! Me pals and me had a grand time and danced so much in your house we nearly straightened our curls. But worry ye not. We found a place for our gold. We’ll not be telling you easily, but in rhyme ye’ll be told! The rules of this chase are easy, you know. Be kind to each other don’t go fast, please go slow. so include them in all and walk- don’t run!" On the table was also the first clue of many written in the tiniest of green, curly-cue text. "The first of your clues is because for chocolate gold that you hope. Tis in a place you’d be sure to lather your body with soap! " They found the next clue in the shower. Every year there are even more clues and more intricately worded clues. 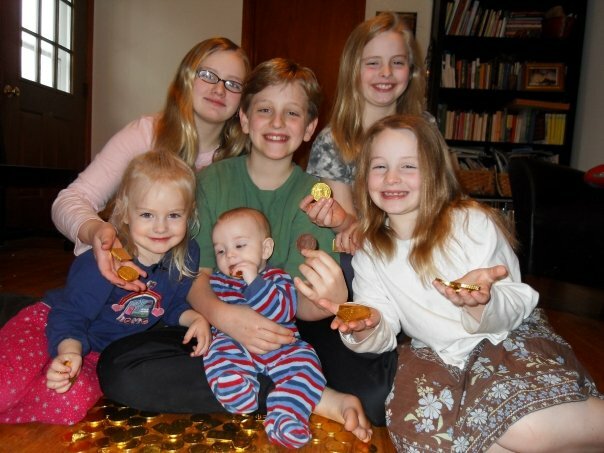 The clues all eventually lead to a "pot of gold" ~ our "gold" being foil-wrapped, chocolate coins. Yum! Last year there were a good twenty five clues. Sitting back with my cup of coffee while listening to them as they give each other turns in figuring out where the next clue will be found is priceless especially when they give the five and three year olds their turns. "HAH! We gotcha now! But wait! This is a mysterious place where a sock always seems to lose its mate!!" "Hooray! You’re all as smart as they come! Make sure you share with all-- including your dad and mum! remember first this is St. Patrick’s Day! be kind to each other-- we’ll be watching you!!! The "gold" is in the ribbon-tied, green fabric. Another tradition we have is that we like to make time the week before St. Patrick's Day to watch a few of my favorite "Irishy" movies. "Darby O'Gill and the Little People" is one of our favorites. I think watching this movie is more for me than for the kids. I just have a thing for that young Sean Connery. The banshee always scares me terribly, even as an adult. Another must watch for us is "The Quiet Man" with John Wayne and Maureen O'Hara which is one of my all time favorite movies at any time of year. As far as other traditions we have, they'd have to do with food. I usually make Shepherd's Pie or Beef and Guinness Stew. I hope you all have a fabulous St. Patrick's Day. If your children are Irish dancing and performing and walking in parades, make sure to take time to celebrate the Irish culture, leprechaun legends, and St. Patrick's Day fun in your own home and with your children.